Recently whatsapp updated some new features May 2016. Today I will show you all these new features. You can reply messages directly from notifications. Do not need to open the whatsapp. Let's see the example. I will send a message to my phone through other phone.Watch on the notification bar. Just down the slider you will find the reply option. Tap on it and reply the message easily and quickly. No need to open the whatsapp. For this features you have to checked the notification option enable. * Go to the settings option. * Go down and select whatsapp. * Now enable show notification option, blue color tic mark, otherwise you can not use this feature. If you open Quick camera button you can see the camera roll and images from the gallery. You can select the images and send or post through chat to your contacts. Open whatsapp and go to the chat option. Now select anyone. Tap on the camera button. This Camera roll feature was not available previous version. You had to select the images from Gallary or Folder. With this features you may save some times and easily send pictures to your contacts. Previously you could add wallpapers in the whatsapp chats. Now you can add solid color wallpapers. Go to the chat of your any contacts and click 3 dot option. Go to wallpaper, then select Solid color. Now you will see the different types of solid color wallpaper. you can use any color and set for your contacts. you can swipe left or right to preview more color and which is the best color for the contact. After selecting the color click on Set button. you can delete, save or archive them. Just hold tap on any chat contact, it will select the contact. now select one by one. There are archive, delete and mute options. You can count the number of selections.Tap on archive . 5 chats archive in 1 tap. Through this process you can delete and mute the multiple chats easily. * For type Italic, use underscore ( _ ) before and after the word and send. * For type bolt use star ( * ) before and after the word and send. * For type strikethrough use this before and after the word and send . 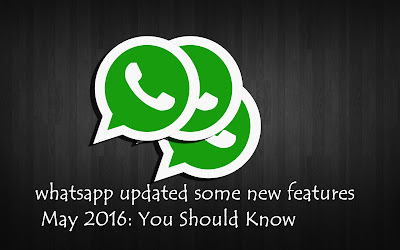 In this tutorial I told you how to use Whatsapp Latest Update and New Features.